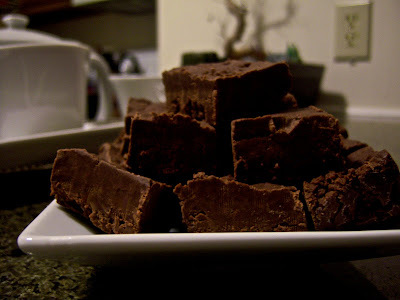 I have been making this fudge for years. Years ago I wanted to make some fudge and looked through tons of recipes. Most of my results turned out grainy. I finally found a recipe and through out the years, I have modified it to my family's tastes. This fudge is really easy and it is never grainy. Heat the condensed milk in a medium to large sauce pan until it is warm/hot. Stir while heating so that it doesn't scorch. Take the pan away from the heat and add the chocolate chips. I never really measure but I try to add about 3/4 of each bag of chocolate chips. Stir the chocolate in the warm/hot milk and let it set until it melts. Stir until it is well blended. If the milk wasn't hot enough to melt all of the chocolate chips, you can heat the pan on low for a minute of two. Add the salt and the vanilla. Pour into a wax paper -or plastic lined--8" X 8" pan. Chill until set, about 3 hours. Cut into pieces and store in a plastic zip lock bag. Yesss I am making this tonight as soon as the dishwasher is done cleaning my dishes..